Every day has a “theme” tied to it. Just this week alone we had the #InternationalDayOfTheGirl #ComingOutDay, and #WorldSightDay. October as a month has #MentalHealthMonth, #DyslexiaLearningMonth, #BreastCancerAwarenessMonth and #ComputerLearningMonth to name a few. With each of these days and months attributed to some social issue, how do you know what to support and in what way? Are issues getting lost in the noise of themed days and months? Leading up to #GivingTuesday (Nov. 27, 2018) we thought it would be timely to start digging into the effectiveness that themed days have. This blog post explores how the themed days became part of the charitable sector marketing scheme and what this means to the strategic philanthropist. When did charities start “theme-ing” days? Because the days are issue based, and not specific charity based it allows for more organizations to come in under the same tent, leverage the marketing collateral that is generated and depending on how creative the organization is, attract new donors to their cause. Themed-based giving – what is it and how did it evolve? Themed-based giving is exactly as it sounds, a collective of causes, either formally or informally, who rally behind an issue to raise awareness that ties directly to their agency. Unlike cause marketing or sponsorships which are not philanthropy, and tend to “… move away from fundraising and focus on marketing opportunities for both the selling organization and the corporate buyer… where funding opportunities are measured against the importance and relevance of engagement focusing on creating, partnerships equal engagement – engagement with our audiences – and engagement with the sponsors’ customers,” (https://culturedays.ca/assets/Webinars2015/CD2015_SponsorshipWhitePaper.pdf?1424808632) Themed giving campaigns are philanthropic in nature and are designed to connect directly with the donor. One of the most successful “themed giving campaigns” is Breast Cancer Awareness Month. Started over 30 years ago in the United States, “[BCAM] is characterised by an effort to underscore the importance of self-examination and screening, whilst promoting existing resources which can assist those motivated by the campaign to adopt these behaviours.” What makes this campaign successful is the not only the dollars raised for breast cancer organizations, which is in the millions, (National Breast Cancer Foundation, Susan G. Komen Foundation, Canadian Breast Cancer Foundation, etc.) but also the number of women who seek out additional information from those organization’s websites and attend their outreach events. The evolution of themed campaigns for social issues has increased as individuals turn to the internet for information about charities and issues. 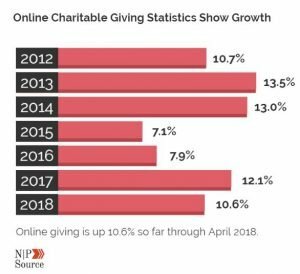 According to NonProfit Source an organization based in the States, they have seen consistent growth with online giving, specifically as it relates to #GivingTuesday. What is even more striking is how themed giving days are attracting Millennial donors. According to NPS, while this demographic makes up about 30% of the US population, about 40% of them make online monthly contributions and 84% of them contribute annually to over 3 organizations. Of this, 15% of their donations comes through on #GivingTuesday. Overall, about half of all donors in North America visit a charity’s website before making a contribution. Most of this traffic can be attributed around special campaigns and themed days (various sources including GivingUSA, NonProfit Source and AFP). So what does this mean for a strategic philanthropist? Don’t get sucked into the marketing of the issue. Instead, consider the bigger picture – what are you trying to solve? Why are you interested in that issue? How are you allocating your non-financial assets to the cause? Then think about how your support fits into the larger scheme of the organization’s funding needs. Just because a campaign is going on, doesn’t mean that this is the time that they need the funds most. Themed days for social issues may get you thinking about the cause, but just like any type of awareness raising, it should be integrated with your overall philanthropic strategy.